A vintage hutch combines living elements with relics of death; chair and lamp from A.K.A. Stella Gray. She opened the shop A.K.A. 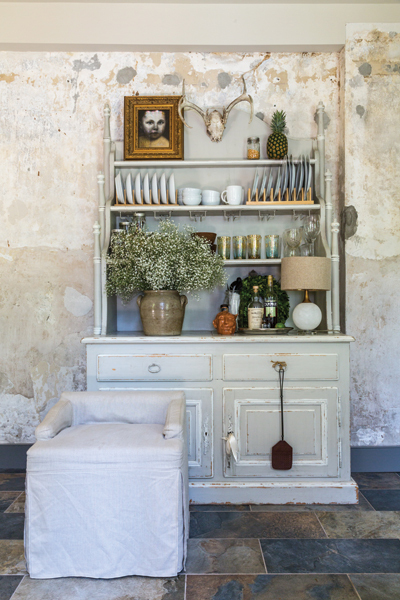 Stella Gray, offering wares for the home in a design style that she calls “Bohemian luxury,” not focused on perfection, but by forging together a beautiful mix of pieces that, in the end, create a scheme reflective of being bold, creative and carefree. The most important elements are the incorporation of extraordinary textiles, rugs and pillows, along with relics of nature and the addition of artwork and utililzation of the mix of high and low and vintage and modern. The laidback, easy-going style focuses on the use of unconventional arrangements to create settings that are stylish, eye-catching and somewhat offbeat. It’s a trend that is exceedingly popular in both fashion and interior design. In modern usage, the term “Bohemian” is applied to people who live artistic lives, much like the adherents of the Bloomsbury Group of the last century. As a style, it is a phenomenon in design where the trend is to bring back vintage styles for the modern era. Bohemian luxury combines organic, colorful, detailed pieces along with simple, modern pieces. The 1850s exposed brick wall is considered a work of art. All furnishings, accessories and artwork shown throughout are from A.K.A. Stella Gray. Knost created her signature style using textiles through the use of rugs and pillows, along with relics of nature and adding in artwork, while utilizing the mix of high and low and vintage and modern furnishings. A romantic French-style bed has an antique Kuba cloth from Africa used as a coverlet. The large photograph on the dresser is by Morgan Miller from Gallery Orange. A French-style bed is complemented by an industrial lamp. The courtyard in front of the carriage house with no street address suits the Bohemian luxury style of Dianna Knost. The most modern iteration of the Bohemian luxury style has been seen since the early 1990s and, although appearing to wane from time to time, has repeatedly re-surfaced in varying guises such as Boho Chic. For Knost, it never went away. Many Bohemian elements became popular in the late 1960s, and some date back much further, being associated, for example, with pre-Raphaelite women of the mid-to-late 19th century. With her striking mane of auburn curls, Knost herself could easily be taken for a pre-Raphaelite beauty. Knost recently downsized to an 1850s carriage house, where carriages were kept in the 19th century and cars were kept in the 20th, with small quarters upstairs for the carriage driver or chauffeur. The structure sits on a large property in the Garden District and has no street address. The quirkiness of having no street address complemented the Bohemian aesthetic for which Knost is known. Now renovated, the original brick was retained and exposed to create an interior wall much like a massive work of art. Knost has kept the furnishings (many of which come from her shop) pared down and stellar. A stenciled zebra hide is thrown on the organic slate floor. A velvet sofa adds sensual luxury. Artwork is eclectic, and the objects chosen are conversation starters. Elements of nature are liberally scattered throughout. On the second floor – where the carriage driver once slept – is a treehouse-like aerie containing a large bedroom, ample closet and en-suite bathroom. Knost combined a romantic French-style bed with industrial elements. The coverlet on the bed is an antique Kuba cloth handmade of African grasses and shells and dyed using roots. These are the design elements of Knost’s signature style. The feeling is both feminine and masculine. Antiques coexist with vintage and modern. The textural combination is alluring and a testament to the Bohemian luxury that Dianna Knost excels at creating.